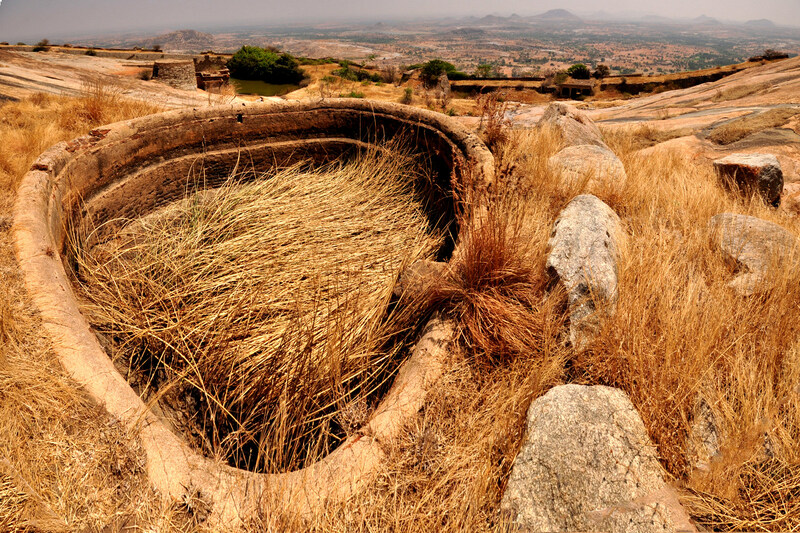 Channa Rayana Durga (Fort) is a beautiful backdrop of a village near Madhugiri in Tumkur district. It is at a distance of 85 kms from Bangalore. As per the history, this fort belong to the Maratha rulers and then got transitioned back and forth to the Mysore Wodeyars. Most of the fort is in ruins without anybody to take care of the same. There are some old structures, huge pond and some temples that are worth seeing. The hillock is a monolith and it is a nice place for a small trek. There are not many tourists who visit the place and hence the place is free of litter and looks neat. Blue sky as a backdrop for these lovely rocks is a treat to watch. Here are some of the panoramic shots from the fort. Backdrop of the mountain ranges around Madhugiri. This one among the nine forts. Entry door to the fort. And there are many such doors in the fort. Many such mantaps decorate the fort landscape. And they are the best places to rest. Looks like very old dried up well/tank. Wonder why they had built this. The best view of the rocks and the fort from here. That's a nice photo-journey of the fort ! Looks like a great place !! Was a lot greener when we visited in Sept though. Did you guys get inside the highest structure? Where the brick structure is pretty much intact? You have captured the bleak beauty in all its ravages. Great pics. The photograph that I liked most is the seventh from top, with the watch tower to the right. The fort on top appears like a special effect in a Hollywood film. The photograph that is a mystery is the brick and mortar "well", third from bottom. Wonder whether it was for storage of grain.